KIEV, Ukraine -- Fighting surged between Ukrainian troops and Russia-backed rebels in the east of the country on Wednesday, in what both sides described as the most intense battle in months. 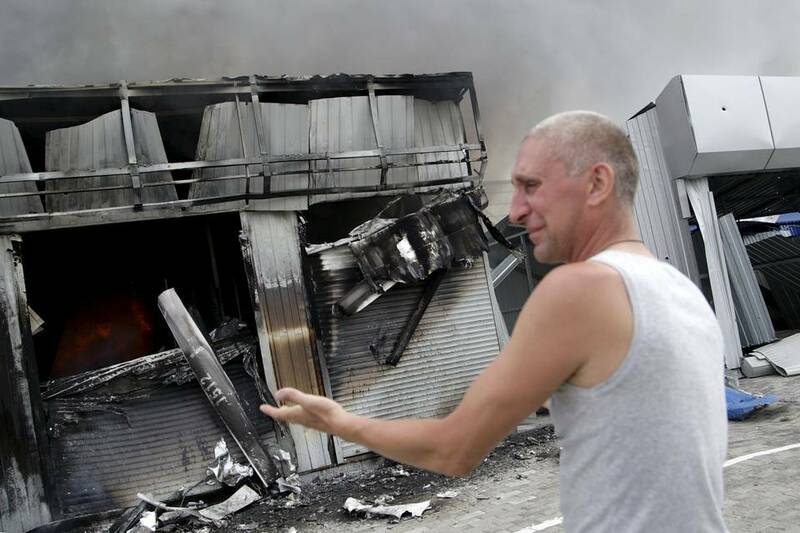 A man reacts next to a shop, which was damaged by a recent shelling, at a local market in Donetsk. Ukrainian troops and pro-Russian separatists fought their most intense battle in months on Wednesday. Ukrainian officials said that in the early morning, up to 1,000 rebel troops attempted to take the front-line town of Maryinka, near the rebel stronghold of Donetsk. By evening the fighting had died down again, officials said. A posting on the Facebook page of Yuriy Biryukov, an adviser to Ukrainian President Petro Poroshenko, said two soldiers were killed and 30 wounded. Vladimir Kononov, a rebel commander, said that 15 people had been killed on the rebel side. Kiev and the U.S. blamed Russia. The U.S. also said it has observed Russian troops operating jointly in eastern Ukraine with rebel forces. “Russia bears direct responsibility for what’s happening here,” State Department spokeswoman Marie Harf said. Speaking in Berlin, Ukrainian Foreign Minister Pavlo Klimkin called the escalation Russia’s usual attempt to make noise ahead of a major event, noting that Mr. Poroshenko is to speak in Parliament on Thursday, and the Group of Seven summit in Germany starts Sunday. “If something’s coming up, the Russians always organize something on the ground,” he said. President Barack Obama will attend the summit, where the situation in Ukraine is expected to be a top issue. Rebel leaders and Moscow accused Kiev’s forces of initiating the fighting. “This is a provocation from the Ukrainian side, which started shelling our positions all along the front,” Kononov said. A peace deal reached in February called for an immediate cease-fire and for the withdrawal of heavy weapons from the front line. That has helped significantly reduce civilian and military casualties in recent months. While sporadic fighting has flickered in several areas, there have been no major advances since. “After the cease-fire there were some small conflicts. but here (in Maryinka) we had the use of tanks and heavy artillery for the first time,” said Oleksandr Poronyuk, a spokesman for Ukraine’s military operation in the east. Mr. Poronyuk and other Ukrainian officials said that there was still sporadic shelling of Ukrainian positions in Maryinka but that the fighting had largely died down by late afternoon.